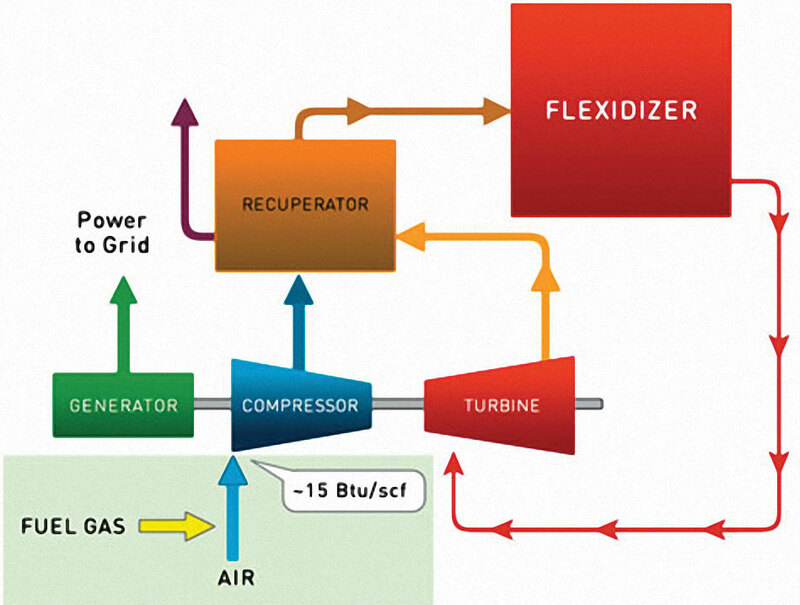 The Ener-Core Power Oxidizer EC250 is the integration of an power oxidizer system (instead of a conventional internal combustion engine) and a FlexEnergy turbine, that creates an electricity and thermal energy production system with almost zero emissions and a wide range of gaseous fuels. The EC250 is able to operate on dilute gas streams with as little as 5% methane content. Moreover, it can handle gaseous fuels that contain siloxanes and moisture. Generates electricity from existing gas sources at landfills, anaerobic digester applications, such as wastewater treatment plants or dairy farms, coal mines, industrial plants and oil fields. Eliminates the need for gas compression and prior siloxane removal. Runs equally well on 100% (1000 Btu/scf), 50% (500 Btu/scf), 15% (150 Btu/scf) and 5% (50 Btu/scf) methane fuel. Operates cleanly and efficiently with a wide range of fuels including fuels with varying energy content. Produces emissions (NOx, CO, VOCs) below 1ppm, significantly lower than those from other power plants and flares. Integrates two proven and efficient technologies – gas turbine technology with thermal oxidation – in a ground-breaking fashion. Scales to match the available gas energy. The Ener-Core Power Oxidizer EC250 eliminates the complexity and expense of fuel conditioning required by traditional technologies. The Ener-Core Power Oxidizer EC250 is the only solution of pure energy that works directly with a gas of low BTU. 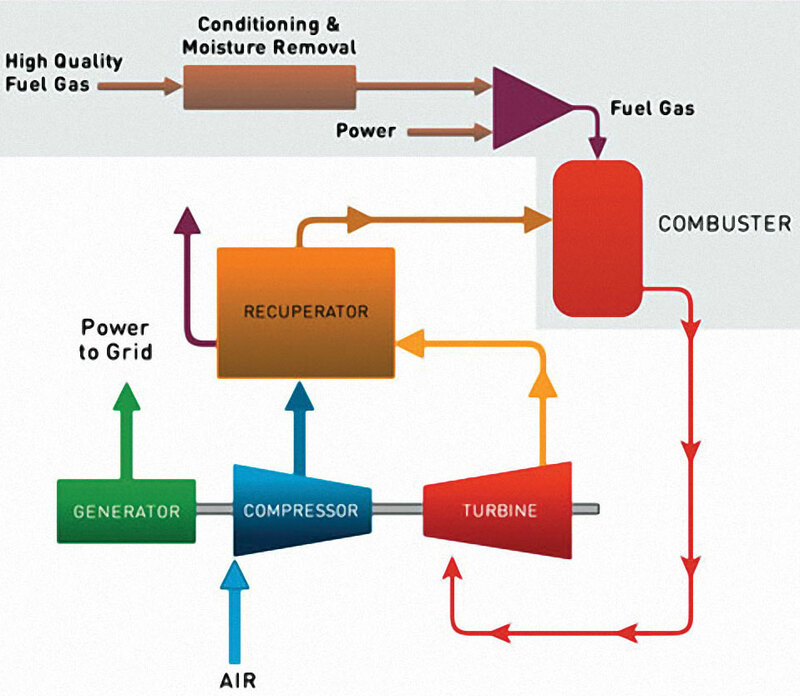 Figure 1 shows a traditional gas turbine station: In conventional technologies, compressed fuel is injected into compressed air and combusted to raise the temperature even further. This high-temperature and high pressure fuel/air mixture spins the turbine at high speeds to generate electricity. Each fuel is different and therefore requires its own compressor, clean-up and unique combustor. The siloxane removal and fuel conditioning system is the weakest link in traditional gas power plants. Fuel conditioning consumes up to 20% of the power generated. With the Ener-Core Power Oxidizer EC250 fuel conditioning and siloxanes removal is substantially eliminated, as shown in Figure 1. The Ener-Core Power Oxidizer EC250 runs on the widest range of fuels down to as low as 5% methane while delivering emissions that are almost undetectable. Figure 2 shows the operation of Ener-Core Power Oxidizer EC250 with its unique characteristics – discrete box at the bottom of the chart. Fuel is aspirated with air forming a fuel/air mixture of 15 Btu / cft that is compressed. The energy released is oxidized by the Power Oxidizer in a gradual oxidizer. The high temperature and pressure developed in the oxidizer is then used to spin the turbine and generate electricity. The Power Oxidizer EC250 does not require a fuel compressor or fuel processing. Regardless of the initial Btu content of the fuel, it is diluted with air at 15 Btu / cft (1,5% methane, or 1.5% of the power of natural gas). The Ener-Core Power Oxidizer EC250 efficiently operates on a wide variety of fuel sources, including waste gas with as little as 5% methane. Over 300 million tons of man-related methane seeps into the atmosphere each year from locations around the world. Ener-Core Power Oxidizer emissions are slated to meet the stringent California Air Resources Board 2013 regulations for waste gas and are over 30 times lower than the U.S. average for existing power plants. Generating clean energy from greenhouse gas sources such as landfills, digesters, coal mines, oil fields and industrial processes is beyond the capability of existing energy technologies. The Ener-Core Power Oxidizer now fills this gap with its ability to utilize all sources of methane.